The dark morning hours of August 2, 1943 found PT-109 idling in the waters of the Solomon Islands. The eerie silence of the South Pacific night was shattered when a Japanese destroyer suddenly emerged from the blackness to slice the small wooden torpedo boat in half. The surviving crewmen and their boat captain – a young John F. Kennedy – began a desperate struggle for life. The sinking marked the final episode of what would become one of the most famous warships in American history. Behind the well-documented account of the future president and the boat’s sinking, is the little-known story of the two officers who first commanded PT-109. Bryant Larson and Rollin Westholm brought the boat to the front lines of World War II and participated in a series of vicious naval battles against Japanese warships. It is a tale that has been around since ancient times - brave sailors using small boats to attack larger adversaries. 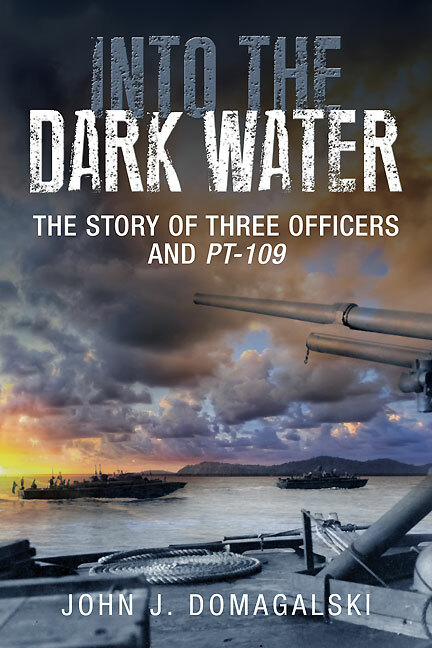 Into the Dark Water tells the complete story of PT-109 from her launch to sinking and beyond by focusing on the three officers who served as her boat captains. The narrative follows the boat into the front lines of the South Pacific through the naval lives of Larson, Westholm, and Kennedy. The story of PT-109 is one of fast boats, frightening night sea battles, unparalleled courage, and fighting men operating in harsh front line conditions thousands of miles from home. Using a wide variety of sources, including previously unpublished firsthand accounts from two officers who served aboard PT-109, John J. Domagalski brings to life this riveting World War II story of combat and survival.